"This dip was the result of endless combinations to try to come up with some dip that I didn't have to cook for work. Serve immediately or it is even better if you leave it in the refrigerator overnight. Store in nonmetallic air-tight container. The only kitchen utensil you need is a food processor. Best with pita chips, crostini, or some kind of chip with less salt." Blend onion and garlic in a food processor until finely chopped. Add artichoke hearts; process until chopped. Add spinach, Parmesan cheese, and vegetable soup mix; process until well incorporated. Transfer mixture to a nonmetallic bowl. Blend cream cheese, mayonnaise, and sour cream in the food processor until smooth; stir into artichoke mixture. 8 cloves of garlic was WAY too much! Delicious! The only change I made was to add a can of water chestnuts (chopped fine). I added 1/4 tsp cayenne pepper to the mayo/cream cheese/sour cream mixture. This is a very easy recipe and is really good. I've made it twice and everyone loved it. 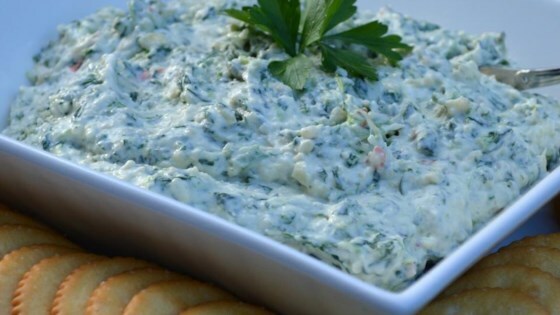 Easy no bake spinach artichoke dip. The recipe made so much but then I realized I had not adjusted the number of servings on the recipe. I’ll definitely make this again!